UFO Sightings Daily revealed yesterday that the NASA Spirit Rover took a sequence of five images over an approximate seven day period that showed what appears to be an animal near a distinctive set of rocks. Two of the five images show an object that appears where other images in the sequence show nothing else was previously there. The object, about the same size as a basketball, had clearly moved, not once but several times in the sequence. The object appears to have a relatively long neck and blends in well with the surrounding rocks. The conclusion drawn by Scott Waring, owner of UFO Sightings Daily is startling. Spirit Rover had captured images of an indigenous form of Martian life that blends in well with the surrounding rocks. The sequence of Spirit Rover images was first found three years ago by Waring. On May 14, 2014, he decided to post an update on his blog providing more detailed analysis of the moving object in the Spirit Rover images. Waring provided the chronological sequence of images that clearly show an object twice appearing where previously there was nothing there. No alteration of the images occurred which were all taken directly from the NASA JPL website created for storing Mars Rover imagery. Waring’s conclusion, is that the images reveal some kind of animal moving on the Mars surface. It’s pretty hard to ignore NASA’s own imagery that clearly shows a basketball sized object appearing to move on the Martian surface. So why hasn’t NASA said anything about it? I thought I would give someone from NASA a chance to respond. There is a sequence of images by the Spirit Rover over an approximate week (Sol 1830-1836) that show a distinctive set of rocks. An object appears in the sequence. Some claim it is an indigenous form of life. I’d like some expert opinion on what it is. I’ve attached a composite of three images in the sequence which show the object (notation is by the life proponent). My post was quickly removed by Bergin, and I was banned indefinitely from the forum. The reason given was that the forum does not discuss UFOs, yet in my request for feedback about the Spirit Rover images, I did not mention UFOs or anything flying for that matter. Clearly, space experts do not want to discuss questions arising from NASA’s own scientific instruments that suggest possible life on Mars, let alone the existence of UFOs. 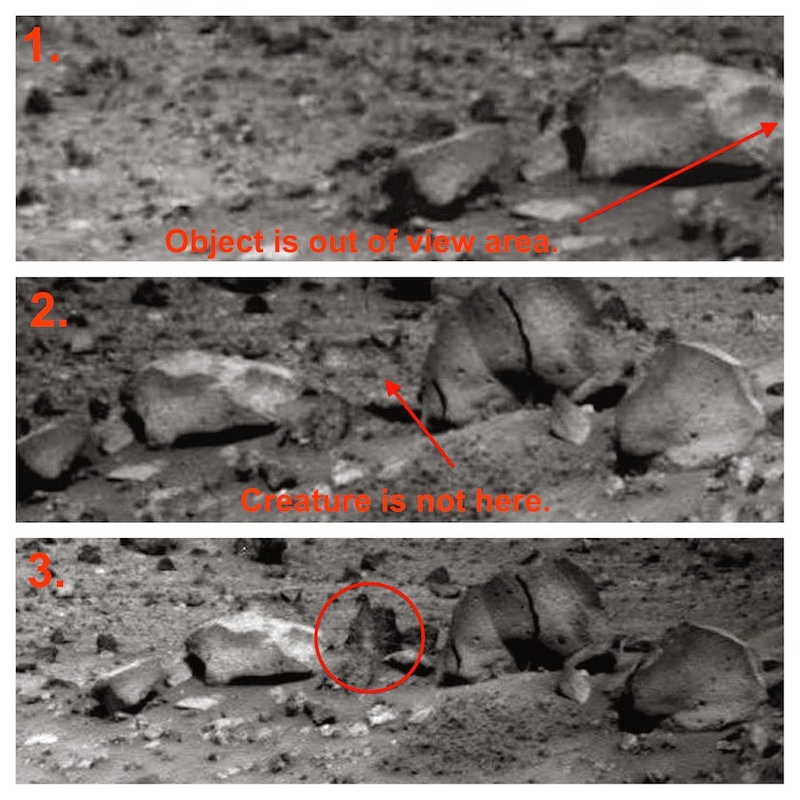 The five images from the Spirit Rover mission show an object that has clearly moved in the sequence. The object appears to be some kind of animal that blends in well with the surrounding rock. Given that NASA experts refuse to discuss such a possibility, it is reasonable to agree with Waring. Hard evidence has been found that there is some kind of indigenous life roaming the surface of Mars. Does Curiosity Rover photo reveal buildings on Mars? Strange light appears on Mars: evidence of an underground base? These are my favourite images so far as I haven’t seen them before. It seems that we have finally discovered something that moves. However movement is not in itself an indication of life, but it is a step in the right direction (it is a candidate). Tumbleweed that blows in the wind. I guess NASA would call this low density rock. If you had a material that was as light as Balsa Wood then it could blow around in the wind, and Mars does have turbulent weather. So this is not necessarily a life form. It may have been, but could now be dead, or it’s some kind of material that is very light. It’s also true that many animals like birds have very good camouflage which would be designed to look like surrounding rocks. At best all we can say is that this is an unusually light material that can move in some way, most likely being blown by the wind.